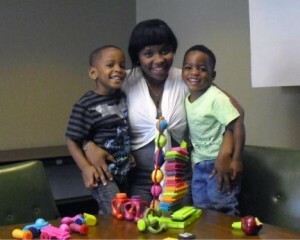 Meet Mirielle Wynn and her two sons. Mirielle attended our small group ELL classes over the summer and brought her sons along because her husband, who is a soldier, is deployed overseas. A native of Haiti, Mirielle improved her English and is now working part-time. She pays two of our students to babysit while she is working. Mirielle found out about the job opportunity from another student. She has developed a network of friends from the classmates she met at Literacy of Northern NY.